Ian Beesley served in the Cabinet Office, H.M. Treasury and 10 Downing Street, where he was Head of the Efficiency Unit under Margaret Thatcher, and he has a PhD in History from Queen Mary University of London. 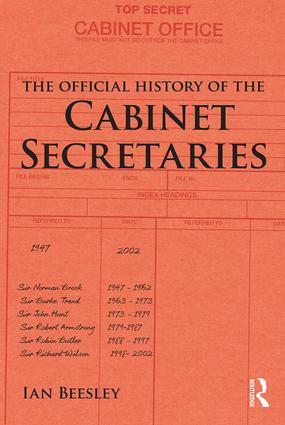 This book is the official history of British Cabinet Secretaries, the most senior civil servants in UK government, from the post-war period up to 2002. In December 1916 Maurice Hankey sat at the Cabinet table to take the first official record of Cabinet decisions. Prior to this there had been no formal Cabinet agenda and no record of Cabinet decisions. Using authoritative government papers, some of which have not yet been released for public scrutiny, this book tells the story of Hankey’s post-war successors as they advised British Prime Ministers and recorded Cabinet’s crucial decisions as the country struggled through the exhaustion that followed World War II, grappled with a weak economy that could not support its world ambitions, saw the end of the post-war economic and social consensus and faced the 9/11 attack on the Twin Towers symbol of Western dominance. Click here to purchase the title or to find out more.